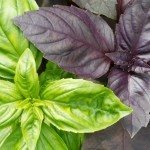 I am growing basil indoors from seeds. I have sprouted the seeds and planted them in a seed starter. For soil I mixed a bag of manure with a bag of potting soil and the soil from a pot that I used in the past. I have a 150-watt bulb. How often and how much water should I give them? How much light should I give them every day?